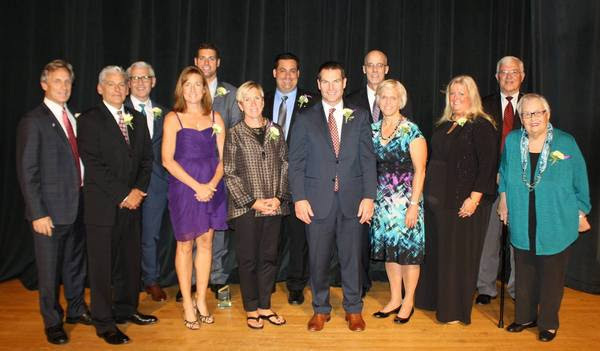 The Civic Auditorium was packed on September 24, when the Lakewood Rangers Education Foundation honored the achievements of Lakewood City Schools athletes, distinguished alumni, and staff at the annual Hall of Fame Celebration. Thirteen people were inducted: four staff, four athletes, and five distinguished alumni. Athletic honorees:Luke Beeler '99 for baseball; Chad Higgins '91 for track; Kathy Nortz Lanese '81 for cross country; and Mark Verdova '75 for basketball. Distinguished alumni honorees: Len Forkas '77, CEO of Milestone Communications and founder of Hopecam; Glenn Mueller '73, CEO of RPM, the largest Domino's franchise; Dean Scarborough '73, president and CEO of Avery Dennison; James Wooley '75, partner at Jones Day; and Kathleen Hart Young '78, pharmaceutical scientist and holder of 22 patents (posthumously inducted). Staff honoress:​ LHS principal Vincent Barra; LHS English teacher Jamie Cure; LHS English teacher Gail Meinke; and Harrison kindergarten teacher Charlene Morford.